I name my years and I like them to give meaning to what I want to accomplish in the year. We are at the halfway mark for this year and so I wanted to reflect a little on how the Year of the Rainbow Unicorn Butterfly Kitten was doing. It has had its downs with my father passing but aside from that major hit to my life I have been doing quite well in the realm of being more magical. In an overall sense life is magic. So far this year I released 3 mobile games. I have sat in the best seats for multiple shows in Vegas where I drank champagne and ate chocolate covered strawberries. Granted by myself but I take myself on the best dates. I got to spend some time with my sister who I hadn’t seen in a few years. I’m working now on projects that I am really excited about. I finished out a one year yoga program that brought me a good bit of training and knowledge about myself. I had a number of beautiful people come into my life via couchsurfing. I started blogging again. I am working on being a better me physically, mentally and spiritually. 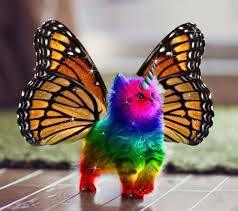 I look forward to the next 6 months of the Year of the Rainbow Unicorn Butterfly Kitten.